Part 1: Suffering a Crisis of Faith? 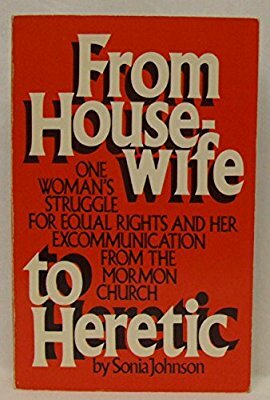 Grow Your Own "Sacred Grove"
Mormon activist Sonja Johnson's efforts to pass the ERA (she was founder of "Mormons for ERA"), her subsequent Church excommunication for apostasy (which made national news and interviews around the talk show circuit), along with her book From Housewife to Heretic. 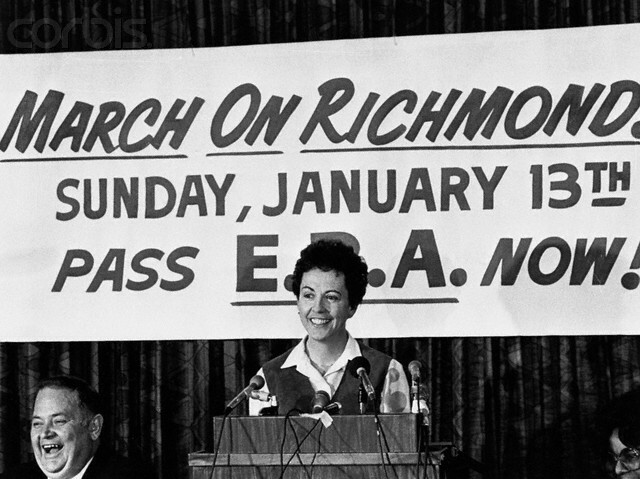 She also spoke at the 1980 Democratic Convention. The internet would not be invented for nearly 20 years, thus information regarding Church history was very limited and opaque at the time. My sister and I had grown up on the swells of second wave feminism. Within LDS culture, many women of our generation had not yet come to value a college education---let alone a career. And there wasn't much encouragement to attain them. 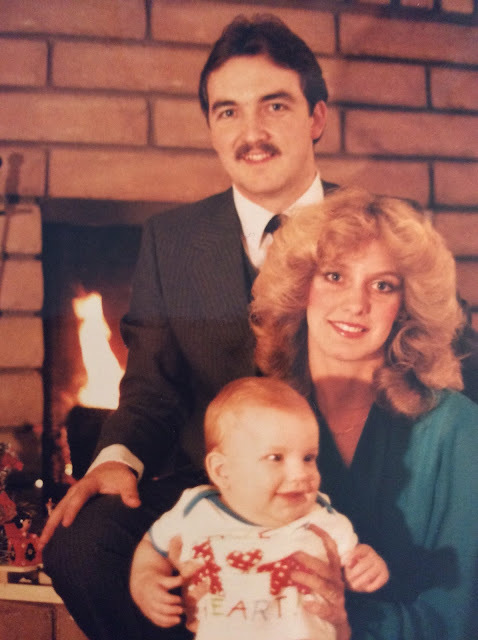 Young LDS women (including my sister and I) married young and were expected to have children soon after. Lots of children. To our eternal gratitude, our dad was a college instructor, so he taught us the value of higher education. My mother also exemplified this principle by earning her college degree when Janet and I were teenagers. Consequently, my sister and I followed in our parents' footsteps and worked hard to obtain our college degrees (and later graduate degrees) after becoming wives and mothers. 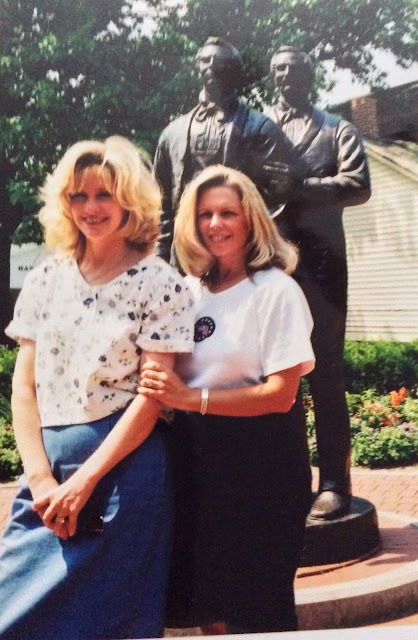 Janet and I in front of the Joseph and Hyrum Smith statue at Carthage Jail in 2001. 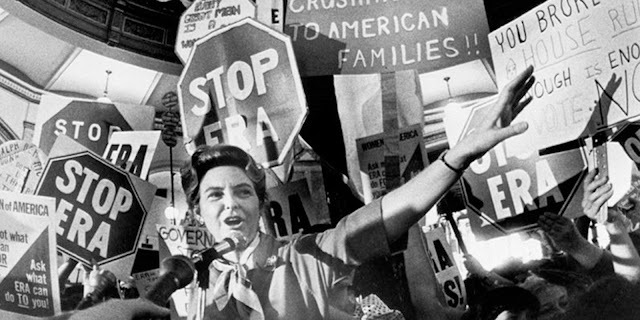 Artificial birth control was also discouraged. Many times discussions in church and among friends centered around quotes from early prophets---especially one from President David O. McKay: "Where husband and wife enjoy health and vigor....it is contrary to the teachings of the Church to artificially curtail or prevent the birth of children. 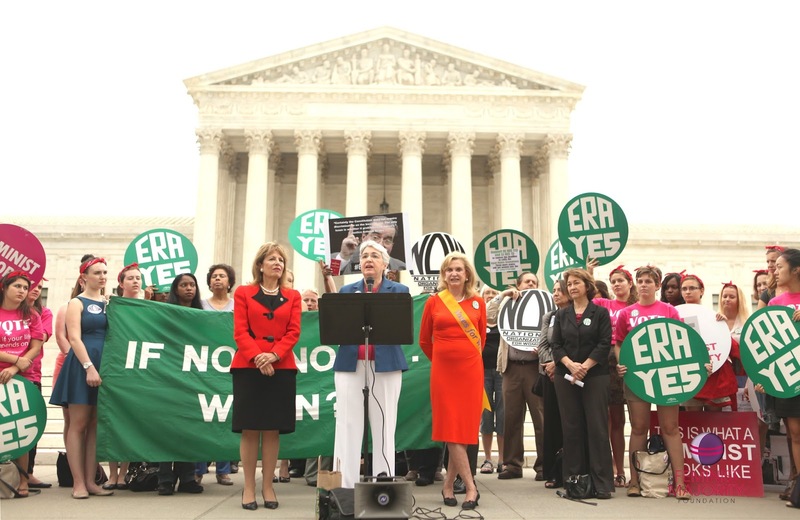 We believe that those who practice birth control will reap disappointment by and by" (Ensign, May 1971). Time and again, I struggled and prayed because of this! Gender roles were much more pronounced. Below is an Ensign article published six years before I was married. The article contains advice for husbands and wives. Some specifics for husbands: "Be man enough to change the baby's diapers...and occasionally bathe the children." Some specifics for wives: "Prepare good meals for him, especially when he is late for dinner. Take telephone messages for him carefully and see that he gets them. Free the telephone when he needs it." 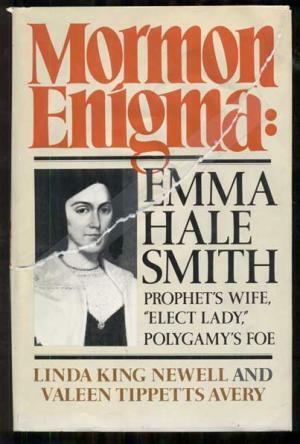 The rest of the article can be accessed at: https://www.lds.org/ensign/1973/06/for-husbands-and-helpmeets?lang=eng Again, I'm not suggesting that this advice is inherently wrong. 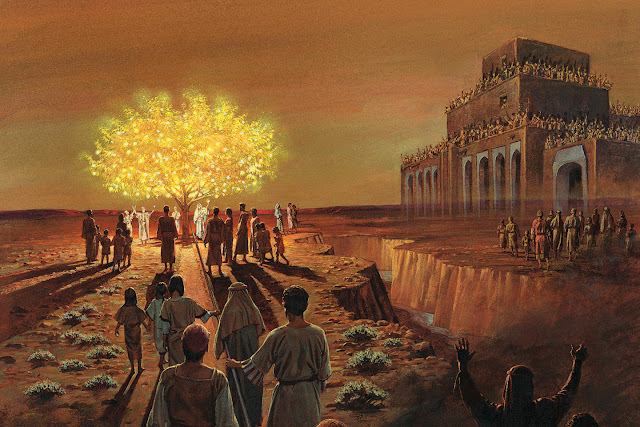 My point is to illustrate mainstream LDS cultural expectations during that time. 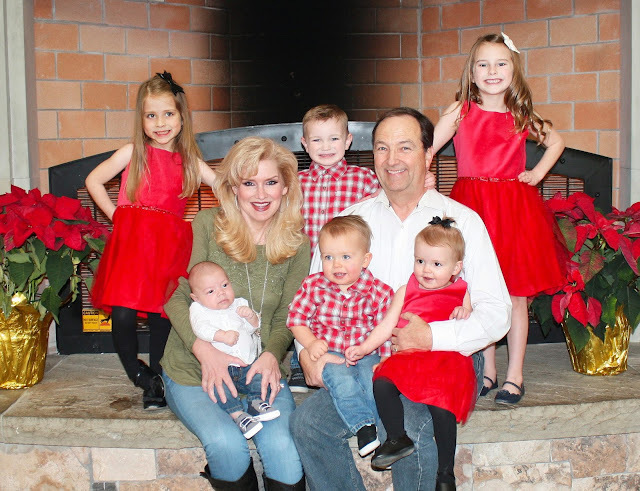 As previously mentioned, Janet and I struggled to fit ourselves into the "ultimate Mormon woman mold." Neither of us wanted to give birth to congregations of children. (I eventually had four children and Janet had three.) Unlike me, Janet enjoyed (and was more proficient) in baking. We both made sure our homes were clean and orderly, and we were both good cooks. (Although I never enjoyed cooking, I was always in the kitchen because I understood the importance of nutritious meals and family dinnertime.) Neither Janet nor I enjoyed sewing (Janet enjoys needlework), but we had sewn a lot of our own clothes in high school. During my early years of marriage, I often sewed until it was no longer cost effective. Still, I felt little joy in sewing. Or baking. Or crafting. Do you, dear readers, have similar feelings? Do you struggle with your faith? Do you struggle to "fit in?" Do you feel insecure or fearful regarding various aspects of LDS culture, Church policy, or doctrine? Are you rattled by competing voices within and without the Church? Are you troubled by Church history? Do you feel guilty for questioning your faith? Be assured, you are not alone. Even better: our faith in Jesus Christ can supersede any doubt. He is a soft place to fall when we take our doubts and fears to Him. Their land is full of idols; they worship the work of their own hands, that which their own fingers have made. And the mean man boweth not down, and the great man humbleth himself not" (2 Nephi 12: 8-9). Not surprisingly, this mindset insidiously affects Church members. Offense toward Church leaders and Church doctrine tends to stem from (and further feed) pride and arrogance. Thus, it becomes easy to negatively judge Church leaders and doctrine using society's toxic lens while undermining our faith. The Apostle Paul described the use of distorted lenses as "looking through a glass darkly." Surely, there's no sin in having fears, doubts, and anxiety. However, society's dark lens need not be our lens. A couple of years ago, a young, very intelligent, and very educated friend of mine asked incredulously, "I can't believe that you, Julie, would put your trust in the Prophet and Apostles before your own judgment." I responded, "That's not what I said. 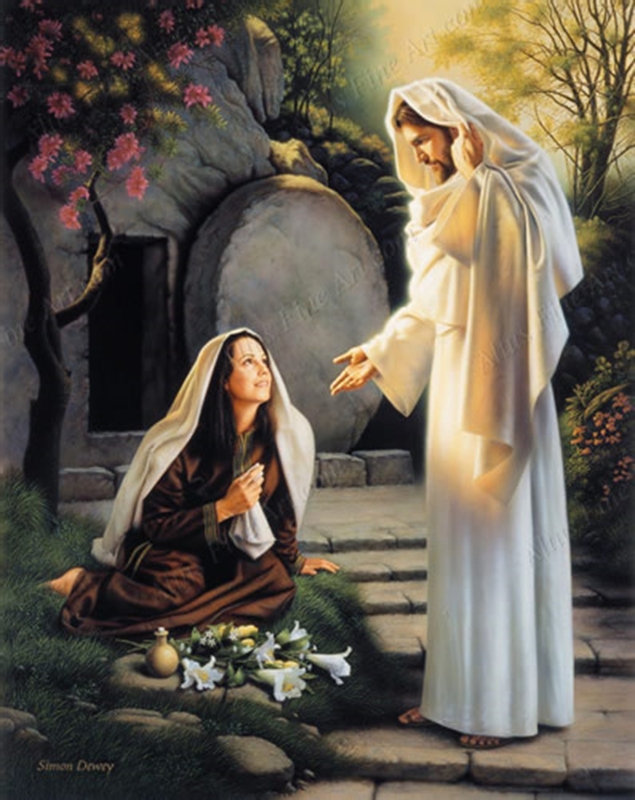 I put my full faith in Jesus Christ. When I follow Christ in humility, He leads me to righteous conclusions and increases my faith in the Church, its leaders, and its teachings." As the years pass, I watch as my friend's faith falters. I fear my friend's intellectual reasoning will reason herself right out of her faith---and out of the Church. Furthermore, as a college educator, I believe arrogance and pride are the twin blights in and of academia. I've encountered many brilliant professors and academics who, because they have acquired a great amount of secular knowledge, have also acquired a great amount of pride and arrogance along with it. Again, please don't get me wrong. I don't fault educated people. I don't fault people who question their faith, Church leaders, and doctrine. Asking questions is healthy and part of our spiritual growth. However, contention and loss of faith happens when questioning becomes agitating. When agitators use contention, perpetual "sadness," and anger to persuade and/or to bring about change in Church doctrine and policy or to criticize Church leaders, we should not allow them to chip away at our faith (as they often chip away their own faith). Christ clearly teaches that negative energy and contention drive away the Spirit and "are not of me." The fruits of the Spirit are not sadness and anger but peace, love, and joy. When we draw close to God and use the Savior as our personal lens, our vision is clarified and purified. We must lay aside our sins, and not hang down our heads, for we are not cast off. Nevertheless, we have been driven out of the land of our inheritance, but we have been led to a better land, for the Lord... Wherefore, my beloved brethren, reconcile yourselves to the will of God, and not to the will of the devil and the flesh; and remember, after ye are reconciled unto God, that it is only in and through his grace that ye are saved (2nd Nephi 10: 20-22). Alma's lesson has meaning today. 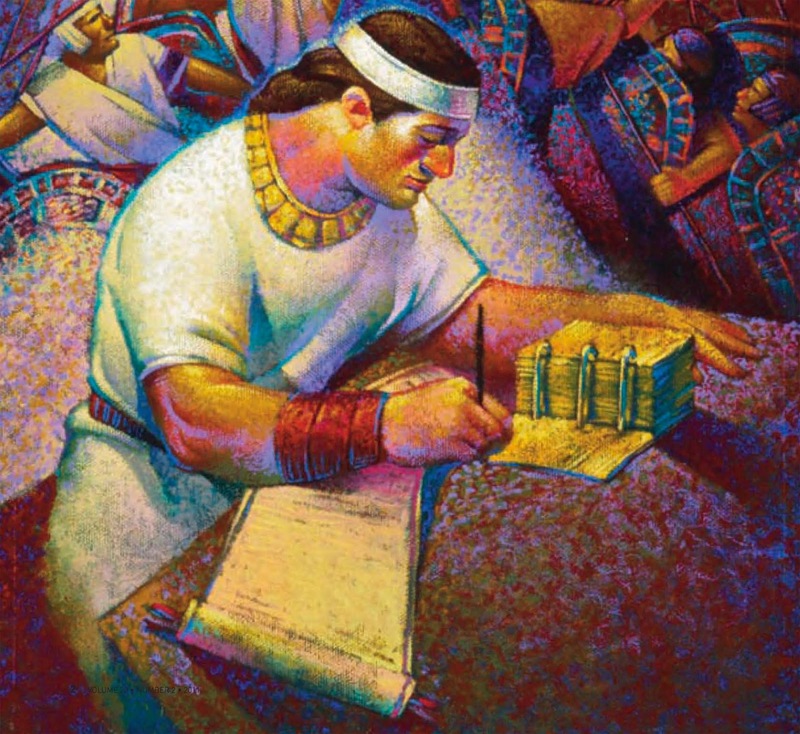 Latter-day Saints seem naturally inclined to focus upon their works. This propensity to rely so heavily on works that document obedience seems to be an outgrowth of our present technological, behavioristic society, which places so much emphasis on observable achievement. Increasingly encumbering and complex, family, career, and even Church activities can disperse attentions toward multiple distractions among tasks and programs. Illusionary time and goal management techniques, if not grounded in a basic Christian nature, can further contribute to task-based rituals and repetitions in life. By extending ourselves laterally outward in noisy worldly ways, we risk becoming swallowed up in the proud illusion of progress (Alma 31: 27), when what we need is to extend quietly inward toward humility and upward toward God. As with the apostate Zoramites who lacked the essential humility that leads to faith, the achievements and prosperity that embellish our lives become meaningless trappings of mortality with no eternal significance without faith. Doing home teaching, earning a scout merit badge, or doing other assigned acts of service can become little more than offerings on the Rameumpton (Alma 31: 21), if our hearts are not earnest and our daily nature not Christian (BYU Religious Studies Center). Genuine humility rather than compelled humility acts as a forcefield against the fiery darts of contentious agitators and self-doubt. Arrogance is the antithesis of humility because it claims a little to no need of Christ, claims to know all the answers, and to know what is best for everyone---the Quorum of the Twelves and the Prophet included. Personally, I would much rather put my faith in Christ and the Brethren than in fellow members who claim to know what's best. Now, let me return to my experience regarding the doctrine of plural marriage. As I mentioned previously, this doctrine fueled my feelings of resentment, dread, and indignation. For years, I pushed away these feelings and refused to think about polygamy. As my relationship with God grew more personal, I decided to "confront" God about this "reprehensible" doctrine. His response to me was swift and sure. I received a very clear and very strong impression that my questions and concerns would not be answered until I sincerely humbled myself. That meant clearing my mind and heart (at least temporarily) of prideful negativity toward this doctrine. I will admit; it took some mental exertion and sustained effort on my part to get there. General Conference was scheduled that weekend, so I waited until the conclusion of the Sunday session to pray for some answers. Feeling inspired and humbled, I walked back to the car, opened the car door and sat there in the empty church parking lot. I poured out my heart to God. I did not receive detailed answers. If anything, I came away with more questions than answers after an hour of prayer. Nevertheless, I felt heard and validated from my Heavenly Father. Even more, I felt respected. I felt His love. I felt peace and joy. And that's all that mattered to me. I drove home with a satisfied and thankful heart. Whenever doubts or questions inflict my soul, I once again humble myself and take my concerns to God. His counsel, His grace, and His love are infinitely more cathartic and therapeutic than anything or anyone else on Earth. The peace that comes from God and our Savior is able to transcend any doubt, anxiety, fear, or even anger we may have in regard to our Church leaders, fellow members, doctrine, and/or Church culture. Faith is the antithesis of certainty. I had to learn to feel comfortable with unanswered questions. I have learned to suspend my judgment of anyone or anything before earnestly seeking answers and insight through the Spirit. 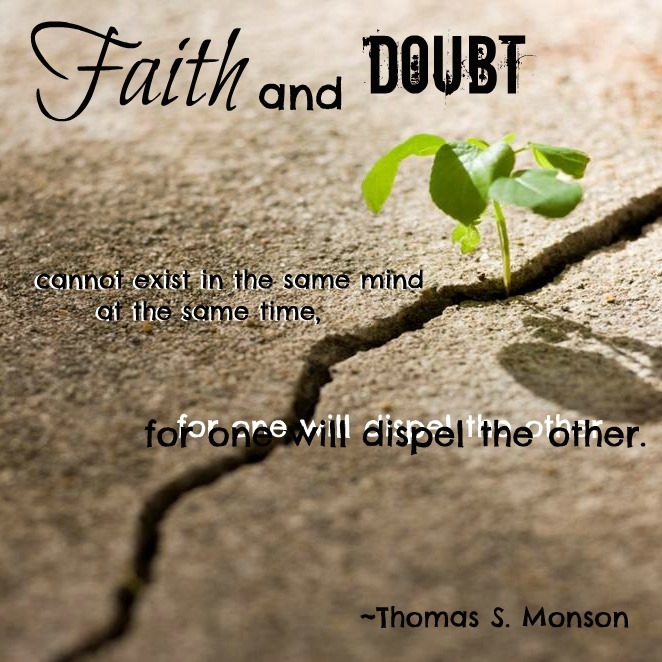 Additionally, the best way (for me) to overcome doubt is to water the righteous seeds of faith, and nourish them through utilizing the spiritual gifts enumerated in the New Testament, the Book of Mormon, and the Doctrine and Covenants. Intellectual study of the gospel surely has its own advantages. I spend significant amounts of time in intellectual study. Yet, ultimately, we won't find lasting answers or peace to our questions using this method. We only find answers and peace by seeking the Savior. While seeking Him, we can ask for ever increasing faith. Having faith in Christ is specifically listed as a spiritual gift in the scriptures. We can pray for this specific gift to increase our faith and, in turn, increase our peace. Faith is not about answers. We err if we think faith solves our uncertainty. Authentic faith is not about easy answers. Rather, it is about finding the courage and wisdom to live with uncertainty. Faith can help turn uncertainties into blessings. In fact, uncertainty can ultimately sustain and make our faith even stronger. I first recognized this truth during a visit to Venice. The city has magnificent churches. Yet, these churches are built on lagoons. The soil is watery and muddy. How can such shaky ground hold up such extraordinary structures? The tour guide explained the way it works. The churches are built on thousands of wooden poles that move with the tide. Those movements counter-balance one another, keeping the structure high and intact. The very shakiness of the structure keeps it standing. The same is true with faith. The uncertainties we face sustain us. They bring us closer to one another. They bring us closer to God. It is through the uncertainties, the challenges, the crises---what the Psalmist calls the "valley of the shadow"---that we see God is truly with us. Uncertainties also sharpen our vision. They help us refine and grow in faith, separating the wheat from the chaff, the sacred from the mundane. It is not certainty that leads to faith. It is the courage to live with uncertainty. An 18th century rabbi named Nachman of Breslov said, 'the whole world is a narrow bridge, and the most important part is not to be afraid.' In other words, life is uncertain. It resembles a rickety bridge. We walk across it in faith: Faith in our ability to do so, faith that the bridge will hold, and faith that God beckons us from the other side (The Secret of Living With Uncertainty, OnFaith Voices, July 17, 2015). I would add that the Church and its leaders may, at times, resemble (in our own minds) a shaky or rickety bridge. As Church members, we too, must walk across it in faith. From the very beginning the pattern followed by the Lord in granting blessings has been: 1) the Lord allows the person seeking the blessing to be tested and tried and 2) once the person humbles him/herself and proves his/her faith by perseverance and sustained faithfulness, the righteous desires are granted. A period of proving, or a trial of faith, is necessary to see if someone who is seeking a special blessing from the Lord will remain faithful in the face of opposition. If a person understands that his/her faith is going to be tried, it gives him/her a greater resolve to be persistent in times of opposition. It is extremely important that you realize that trials of faith are a necessary part of the sanctification process by which we are purified by the Spirit of God. Opposition plays a very important part in this process, for by overcoming opposition and enduring affliction we are, in a very literal sense, purged and made clean. 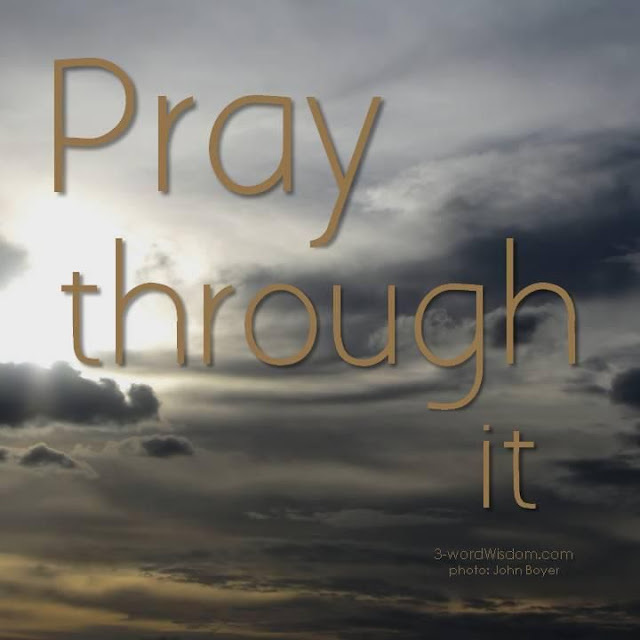 When you endure opposition by serving the Lord to the utmost of your ability---no matter how limited your ability is---the grace of God is sufficient to intervene in your behalf (Drawing From the Powers of Heaven, p. 49-50). For behold, the promises which we have obtained are promises unto us according to the flesh' wherefore, as it has been shown unto me that many of our children shall perish in the flesh because of unbelief, nevertheless, God will be merciful unto many; and our children shall be restored, that they may come to that which will give them the true knowledge of their Redeemer (2 Nephi 10:2). With the Savior's help I am ever learning "not to judge after the sight of [my own] eyes, neither reprove after the hearing of [my own] ears (2 Nephi 21: 2). 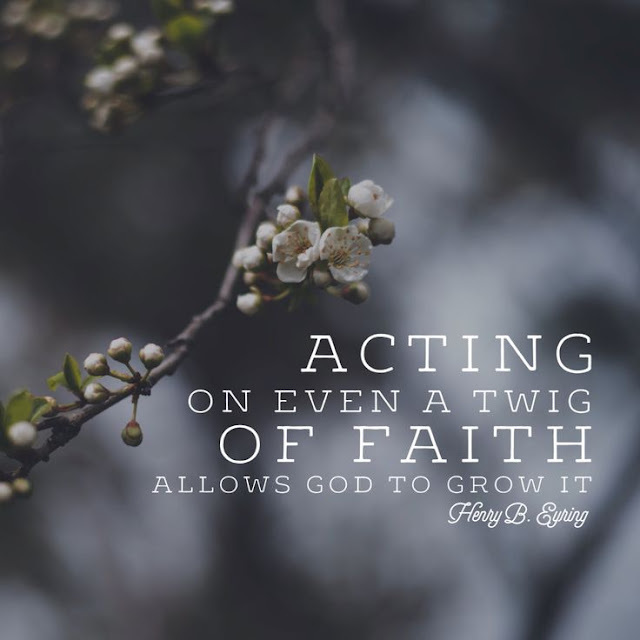 I can testify that many seeds of my faith have blossomed into a strong belief. And my belief has eventually given way to knowledge. And though my knowledge may not be perfect, it is still knowledge and no longer faith. Faith precedes and sustains! I will publish Part Two of this post in the next few days. LDS Women Converse is written in honor of our Savior Jesus Christ, our womanhood, our sisterhood, and our families. 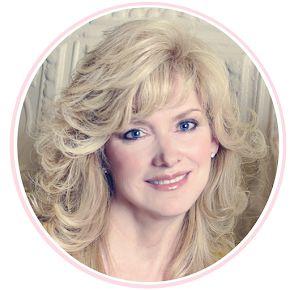 This website is a non-judgmental gathering place for LDS women as we prepare for prophetic events to come. I hope this space will be a soft place in a hard world. Join the conversation! 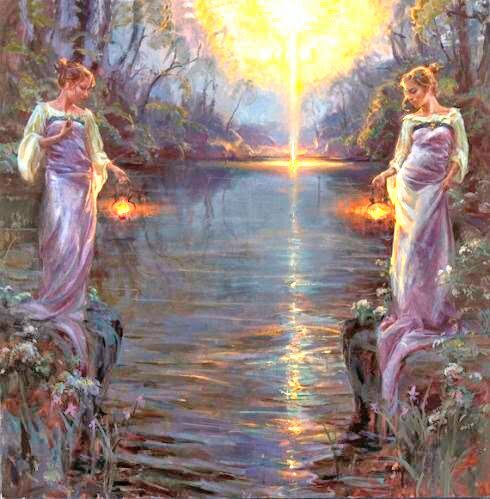 I chose this image of two women holding their lighted lanterns as symbols of our journey toward the light of Christ. As women, we can help each other navigate life's difficult terrain. As women, we can light the path of spiritual preparedness for our families. My son-in-law gave me this painting as a gift. He felt this woman represented my role in our family. 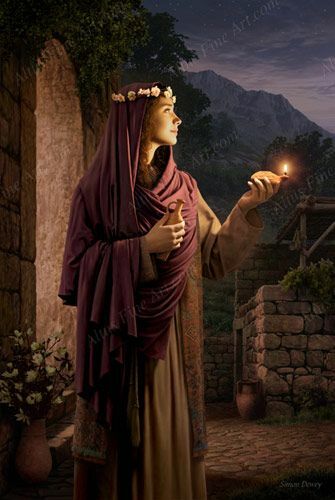 The flask of extra oil in her right hand symbolizes her preparedness for the Savior's coming. “Be faithful, praying always, having your lamps trimmed and burning, and oil with you, that you may be ready at the coming of the Bridegroom” (D&C 33:17). This painting hangs in the entry hall of my home. Like this woman, I feel profound peace while "feasting upon the words of Christ." 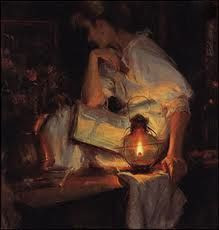 As the lantern lights the scriptural pages, the holy scriptures light the way to eternal life. "The Hem of His Garment"
Academia you've got some 'splaining to do. And She's Climbing the Stairway to Heaven. Are Others Tying You in Knots? Are we denying our denial? Are you afraid of being afraid? Are You Always On Your Mind? Are You in a Right Fight? Are you tired of feeling sick and tired? Be on the right side of history. Does your mission seem impossible? Don't let our wells run dry of the living water. Feeling like you're part of a barroom brawl in an old-time saloon? Feeling the winds of change? Got a Poisonous Gal Pal? Got a shovel and clippers? Greatness and Humility Can Coexist. Hearts of stone are too heavy. I love to see the temple. I'm the one who writes my own story. Imperfection is a form of spirituality. In a Corner Eating Your Worms? Is it all about you? Jesus Christ is the ultimate critical thinker. Living Your Life in Chains? Obey gravity. It's the law. Peace at any price is no peace at all. Perhaps they're not that scary. Raging Tempests? Walk On Them. Suffering from the Disease to Please? Suffering from the Never-Good-Enough-Mom Syndrome? We're Only as Sick as Our Secrets. What are you wearing for Halloween? What's your preference? A can of worms or humble pie? 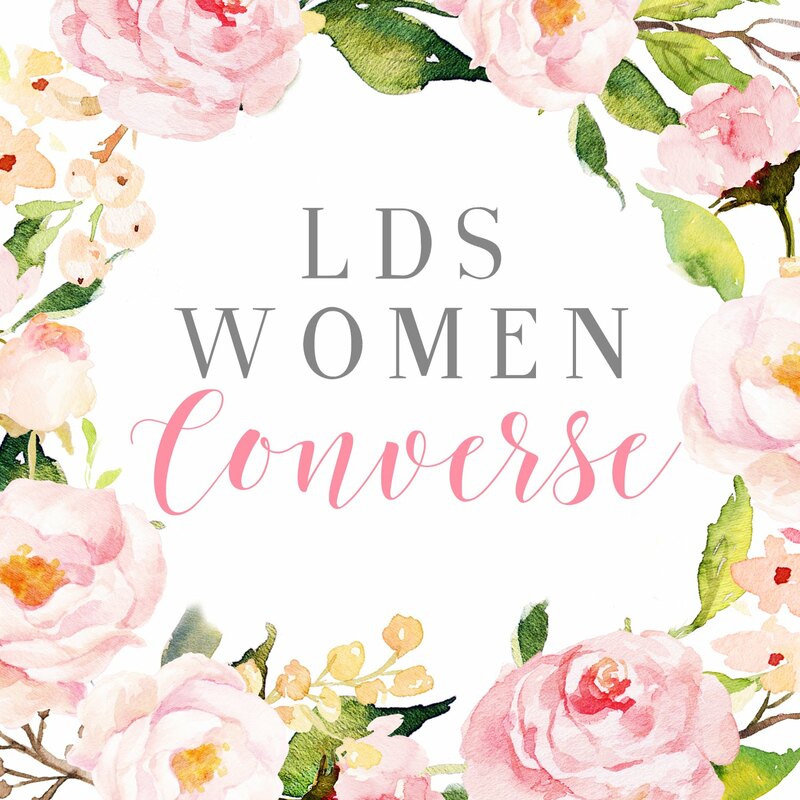 © 2016 LDS Women Converse. All rights reserved.